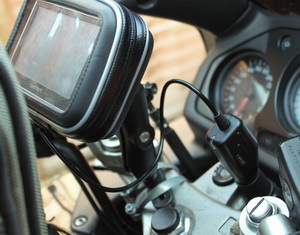 The idea behind this motorcycle GPS mount is that it offers inexpensive solution for having GPS on your bike. If you’re not prepared to pay the high price for the branded motorcycle GPS systems like TomTom Rider or you are just starting going longer distances on your bike, there is an easy option for you. Whatever system you use in a car you can use it on your bike. All you need is the waterproof case with a mount. See on the below photo what I mean. On the downside of this case, the front transparent cover sometimes reflects the light which mean it may occasionally impair the display of your sat nav. I personally think that if you haven't got spare few hundreds dollars/pounds, this is good enough solution as you not only rely on display but voice too. 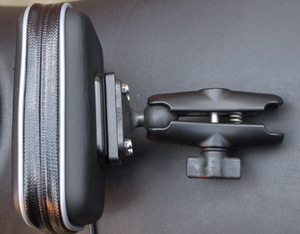 The case easily slides in or out of the mount when you need. Most of GPS mounts as well as this one are made for handlebars like on a bicycle. The trouble is that we talking sport touring motorcycles here and most likely is that the handlebar mounting option is not possible. One way to attach the ball (not the most eye pleasing way) is to use hose clamp clips, see below on the left. The other way, which is much better looking, is to use the GPS yoke mount, below on the right. There will be all different variations for different bikes and the only one that I know off which is a struggle to fit is on CBR1100 Black Bird. As you suspect the 12V power socket is also a must (as if I have to say this) as you’d need to connect your sat nav to a power supply. You would need this with some length of cable depends where you place the socket. 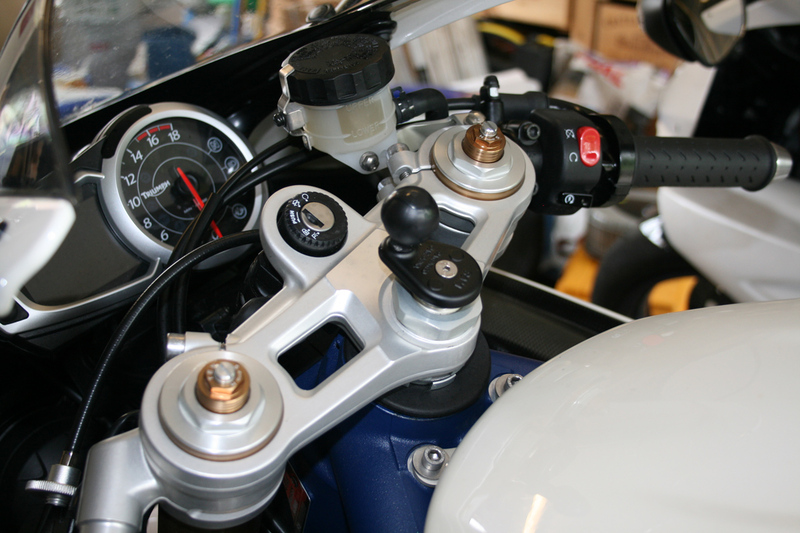 Some prefer installing the socket in the top of the fairing but that needs messing around with drilling and it generally results with longer cable hanging from your sat nav device. I would recommend to install the socket as close as possible to where the sat nav would sit. 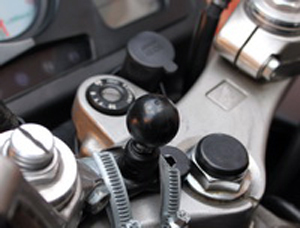 All in all, the motorcycle GPS mount with the budget not so good looking attachment of the ball, GPS and car charger will look something like that on the right. All functional in any whether conditions so you always know where you’re going! Generally, this is the mount that most motorcycle enthusiasts would start with, and this is how I have had it for years. I have done with it around 25,000 miles and for me the case did the job. It is not the best solution for having a sat nav on your motorcycle but it is most cost efficient, budget one that will save you hundreds that you'd otherwise have to spent on the branded motorcycle GPS systems like TomTom rider or Garmin Zumo. On the bad points of this case, it’s not that easy to operate your sat nav on the go through that front panel. My main reason for the eventual change to the branded motorcycle GPS was that my old TomTom did not maintain the power for more than two minutes when disconnecting from the power. This was kind of a pain when you have to be at the bike to plan your journey on breaks.